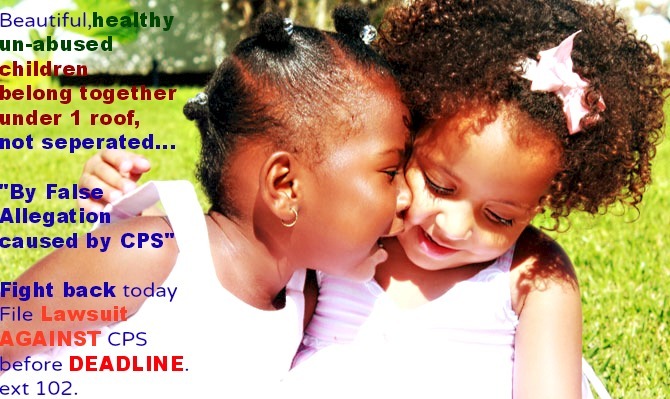 False Allegation?Deadline Near to seek accountability against Maryland CPS,call heather ext. 102. Maryland Child Protection Services Lawsuit Ctr Pro-se Litigant Nationwide Student Of Law Ctr.specialize in inequities,filed,BY DEADLINE pursuant to U.S.C.A.Title 42;Section 1983;and or Section 1985 per civil right violation. FACEBOOK's SUE CPS IN FEDERAL COURT. Be sure when calling our VERY busy office,be sure to have all paperwork i.e. removal papers from MD.,CPS etc. Be sure when calling heather-marie to discuss the MOST relevant points,to your case,and your reason for suing pro-se. Be sure when calling heather-marie ex.t.102 to have copies of document(s)ready to be fax over to our office immediate upon such request. 10:a.m.eastern standard time to 10:pm. Also open holidays,weekends premise on we UNDERSTAND if a deadline approach when your about to file your lawsuit against CPS worker,how much work is involve throughout,hence our student of law clinic,and paralegal specialist ctr.is here for you,even on holidays,weekends year round, Call today! STAND UP and be sure to understand,"When your suing"your finally in a power-play position,and on your way to taking back YOUR constitutional rights,when holding TIMELY CPS ACCOUNTABLE. 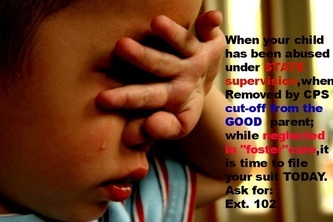 . .
and TIMELY Institute your lawsuit,against child protection services,when suing known as pro-se self file. never even knew of such pre-requisite,of notice(s)issued first, prior and as a condition to move forward to sue for such federal civil right money damages,because most are just copy to paste info sites. 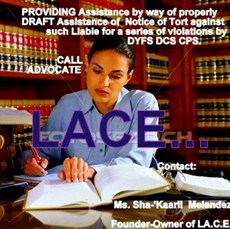 We are not that.Such prowes involving our dedicated,student of law clinic,paralegals,and "trained,degree-level advocate group"under such complexities, involving cps and are proud to be the only nationwide network of its kind proceeding SAME-DAY,no delay with your warranted lawsuit known as self file pro-se. 1-855-602-5557 ext. 102. 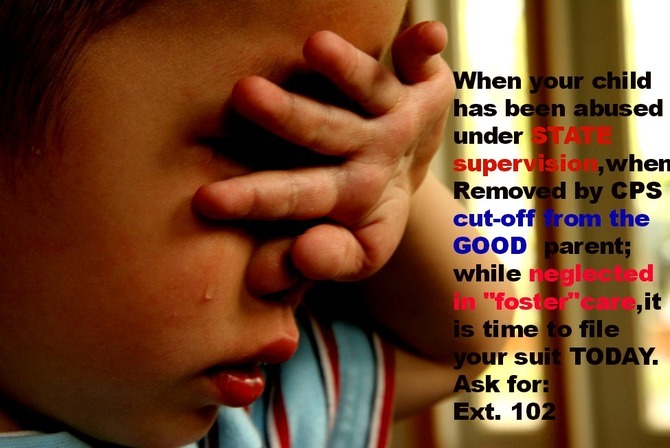 Maryland CPS continue to falsely cite,"We are all about protection of the child,when allegations are made,investigate swift,and look at alternative placement within the"family for the child removed"premise on we feel a family placement(alternative)is preferred than being placed in a Maryland foster care placement. However if true, then why are so many from MD.,contacting Bellas? Simple,because the caseworkers are lieing,and or fabricating,and or not being at all consistent,in court,for which is costing the falsely accused parent,and or grandparents,everything,most important the child ext. 102. Such lawsuit shall begin immediate,no wait,because Bellas believe in ensuring your lawsuit filed pro-se self file has been filed timely,securely by you,the litigant seeking such money damages,per civil right violation premise on maryland CPS worker's misconduct. Such lawsuit premise on improper investigatory;into the removal of one's child to continued-detention,sladerous,defamatory cost yourself to lose a job,employment,and or home.Be sure to understand time is limited to place on notice per defendant responsible,involving cps. Such remedy for state,federal civil rights as case law support from Maryland,to NJ,NYS,California,Oregon,to Ohio,Arizona,and all states in U.S.A. is available through proper file,timely file,by you the victim of child protection services. 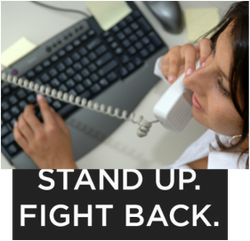 Just because your attorney and or lawyers your calling upon to help ,are not interested nor caring enough to sue for you,do not mean your not able to successfully file timely. Get your suit filed,and begin finally to take back your rights,your family,your life or remain as CPS WANT YOU TO REMAIN IN MARYLAND and that is violated. Your Choice,you decide. . .
DO NOT MISS YOUR DEADLINE TO SUE. Time is quite limited to do so.